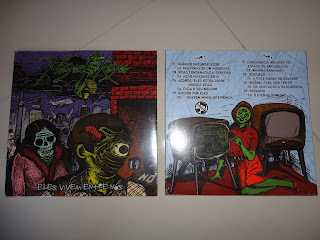 the hole productions: [hole11] PLAGUE RAGES "Eles Vivem Entre Nós" 7"
[hole11] PLAGUE RAGES (bra) "Eles Vivem Entre Nós" 7"
"With almost 20 years of grinding existence, PLAGUE RAGES's new full 7" is certainly the band's strongest material of its long discography. Raw and ugly old-school Grindcore exploding from 18 songs in a single 7"; these veterans are the new kings of Brazilian grind!! The South American answer to Retaliation, Looking For An Answer, P.L.F. and all that is fast and heavy!!"